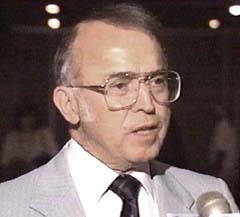 Walt Andrus, one of the founding members of MUFON in 1969, was the International Director of the Mutual UFO Network, Inc. since 1970, succeeding Dr. Allen R. Utke. He had served on the staff of SKYLOOK and the MUFON UFO JOURNAL, starting in 1968. He was the Editor in Chief and was the Editor or Coeditor of the annual MUFON International UFO Symposium Proceedings beginning in 1972. Born in Des Moines, Iowa (1920), Mr. Andrus was a graduate of Roosevelt High School (1938) and graduated from the Central Technical Institute in Kansas City, Mo. (1940). He was a graduate of the U. S. Navy Electronics Technician Program during World War II and taught in both of the above schools. Walt was formerly employed by Mid-Continent Airlines as a station manager in Quincy, Illinois. From 1949 to 1975, Mr. Andrus was employed by Motorola, Inc. in successive capacities as Assistant Plant Manager. Manager of Quality Control and Operations Manager in their Quincy, Illinois facility. In 1975, he transferred to the Seguin, Texas plant as a Production Manager. After a tenure of nearly 34 years with Motorola, Walt retired at the end of 1982 to devote full time to the management of the Mutual UFO Network. The MUFON administrative offices were moved from Quincy, Illinois to Seguin, Texas in July 1975 where MUFON became a Texas nonprofit corporation and an I.R.S. tax exempt organization. Mr. Andrus had been interested in the UFO phenomenon since August 15, 1948, when he, his wife and son had a daylight sighting of four UFOs flying in formation over downtown Phoenix, Arizona. An amateur radio operator since 1939, Walt's call letters were W5VRN. He obtained a private pilot's license in 1947. In addition to presenting slide-illustrated lectures in the U.S.A., Australia, Belgium, Brazil, Canada, England, Italy and Mexico, he has appeared on national television numerous times, including Oprah Winfrey and Larry King. Walt was a member of the Board of Directors of the joint USA-CIS Aerial Anomaly Federation. He was also on the Board of Directors for the influential UFO Research Coalition (URC), composed of Center for UFO Studies (CUFOS), Fund for UFO Research (FUFOR), and Mutual UFO Network (MUFON), organized in 1994. Mr. Andrus retired as International Director of MUFON on July 16, 2000 after 30 years of service in this intriguing position. He was succeeded by John F. Schuessler of Littleton, Colorado.